Your online ordering system offers various options for calculating sales tax. These calculations are configured for each restaurant location in your account, so if you have more than a single location, you will need to perform these configurations once for each location. This allows you to have different taxes at each store, which is often necessary when locations are in different geographic locations. On this page you will see each of your existing restaurant locations. For each one, there is a link labeled Current Time Zone and Tax Rate for this Location. Click on the blue Change This link located to the right of that label. 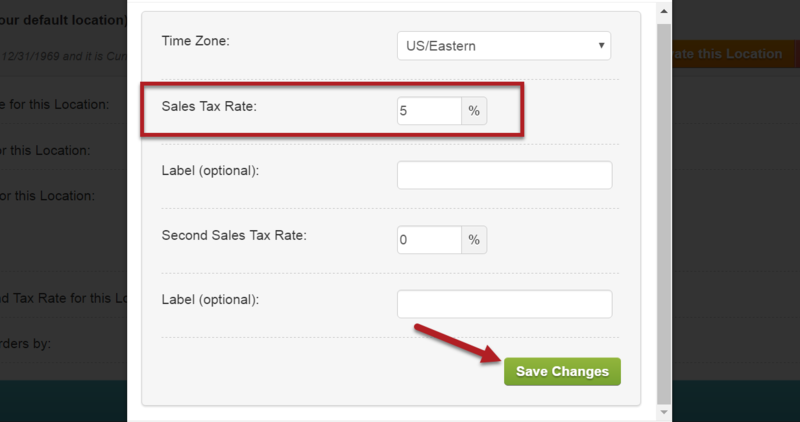 A dialog will open in which you can adjust your sales tax rate for the selected location. You may specify one or two different taxes, depending on your needs. Be sure to click Save Changes when you are done.